All decks are crafted of 7-ply Canadian maple, sized at 7.5" or 8" with a medium concave. All decks feature works by an international team of artists. As we grow, we continue to add to our roster. Original artworks are available for sale on a limited basis and start at $250. 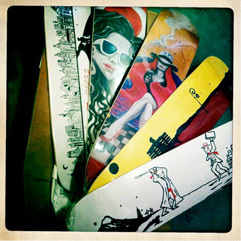 All decks are printed by Chapman Skateboards in NY, USA. Based in NYC, DSD is a growing international team of skateboarders, artists and designers from the USA, Canada, Europe and Australia. 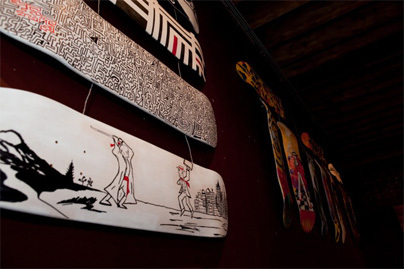 Owner Evan Kanarakis first sold a skateboard featuring his artwork in his native Sydney, Australia ten years before even establishing Devil Street. After migrating to America, Kanarakis started DSD out of his garage in 2010 with a passion for skateboarding, art and design, travelling and meeting like-minds. The brand continues to be fueled by those desires and gains strength as the syndicate of collaborative effort grows. Have a custom design request? Contact us HERE for a quote. Devil Street currently has a full roster of artists but we're always interested in seeing new talent. Hit us up with your work HERE. To obtain our latest line sheet and for any other sales inquiries, please contact us HERE. Devil Street Decks offers extremely limited sponsorship opportunities. If you've got talent, attitude and, above all, are passionate about skateboarding, feel free to hit us up with your vids HERE. Devil Street Decks. Raise Hell.